Kroc Church Atlanta is an inclusive worship and disciple making fellowship. 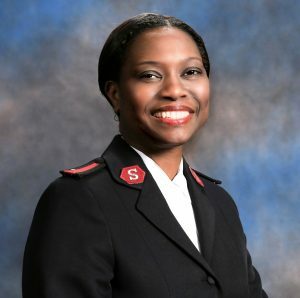 We have been uniquely positioned in Pittsburgh Community and our former Lakewood Corps location since 1927. If you are looking for a church to call your own, or you would like to be around a loving and welcoming group… then the Kroc Church Atlanta invites you to come worship the Lord with us! With open arms we will receive you and together we will journey as followers of Jesus Christ. 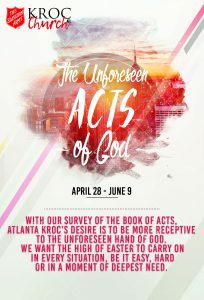 Atlanta Kroc will survey the book of Acts. Seeking a renewed desire God’s unforeseen acts to be the reality of each of our lives. We serve a God who is in the business of blowing our minds! As a result of Jesus’ conquering of the grave everything changes and we can live on the edge of our seats in anticipation of God’s moving in our lives, situations and areas of deepest need. With this series we aim to once again get into the habit of inviting the unforeseen Hand of God in our everyday lives. Sunday School and Breakfast starts at 9:30am.